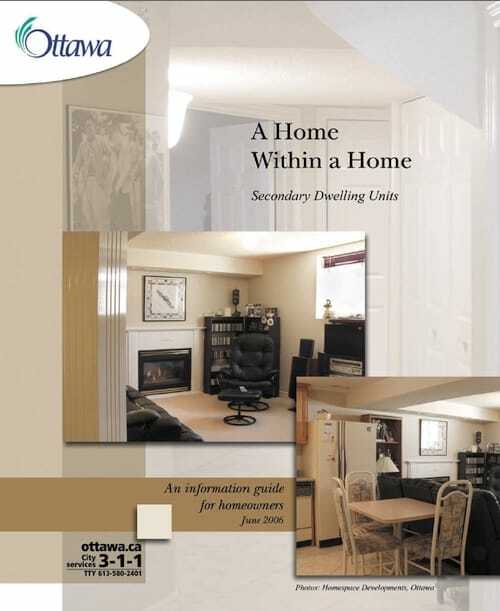 The City of Ottawa loves “Secondary Dwelling Units” – a.k.a. Nanny Suites and In-Law Suites. Though this booklet is from June 2006, most of the information presented is still pertinent (although, for example, the CMHC forgivable loan amount has increased significantly). For some, the challenge is to find separate space for family members as personal situations change. It might mean adding rooms or making other renovations for their children’s caregiver, a university student, an elderly parent or even a returning 20 or 30-something year old child. For others, it may mean renting out space and earning extra income to meet their financial obligations. Homeowners can create separate living space for extended family members or become a landlord and rent to tenants for the additional income it provides. The City calls these “secondary dwelling units”. Advantages include potential income and flexibility of accommodations for family members. This booklet also includes some rules to keep in mind, and considerations such as insurance, property tax and income tax. Plus information on applying for building permits and the CMHC Residential Rehabilitation Assistance Program whereby you may be eligible for a forgivable loan of up to $60,000 (the $24,000 mentioned in the booklet has been increased).